We know that hunger doesn't take a vacation when many of us move on to our summer schedules. That's why most hunger organizations struggle each summer. Donations drop and the number of people needing help actually increases. Children who get fed two meals a day at school through various hunger programs don't have that type of support during summer break. Their families rely upon local food pantries, soup kitchens and youth summer programs to help make up the difference. 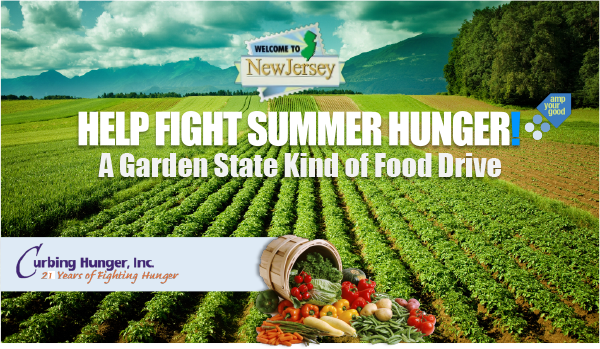 Please join us and help fight summer hunger in NJ. Join our many partners by organizing a drive to support your local food pantry, soup kitchen or shelter. If you are a food assistance organization - let us know if you need help. We've raised over 2.2 Million lbs of food since we began this annual campaign and the need has never been greater. Contact CurbingHunger@gmail.com or FightHunger@ampyourgood.com for more info. Help those in NJ struggling with a healthy food!